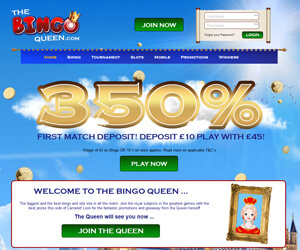 The Bingo Queen | Play with up to £45 Today! 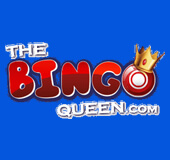 The Bingo Queen has finally arrived, as the newest royal online bingo site to grace the reels for 2016! In the biggest headline since the Queen's 90th birthday, we can't help but feel privileged that The Bingo Queen herself is ‘ready to see us now'! Tipped as the ‘biggest and the best bingo and slot site in all the realm', the site offers a royal bonuses, bingo and slots games fit for a queen and ‘best prizes this side of Camelot'! This colourful, larger-than-life Cozygames site transports you to the heart of London town, with a view of all the iconic landmarks. The Queen will personally welcome you to the reels with a supersized welcome bonus package flashing across the screen. So this is your chance to practice your best courtesy and join the other subjects on a royal adventure to steal the Queen's crown jewels! When you first enter the royal realm, you'll receive a royal welcome from The Bingo Queen herself with a flashing gold welcome package! Trust us, you won't miss it! Firstly, all new royal subjects will be greeted by a guaranteed £15 Welcome Bonus with no deposit required. You'll then receive the red-carpet treatment after you deposit your first £10, as you can pick up a colossal 350% first deposit bonus match to play with £45. The Queen will then treats you to a stunning 500% deposit match on your first 3 deposits! Throughout your royal adventure, you'll be spoilt with queenly treats like Free Bingo Tournaments, Slots Tournaments, Cashback, Jackpot Special, Money Multiplier, Chat Games, Breaktime Quizzer and more! With The Bingo Queen, you can hop on a Bingo Tour of London, through all the iconic 30 Ball, 75 Ball, 80 Ball and 90 Ball Bingo room landmarks, from Big Ben and Victoria to London Hall. You can even visit the Queen in all her glory in Buckingham Palace and try your luck in two awesome Free Online Bingo rooms! With jackpots topping £5,000, you can cruise through 7 progressive jackpot bingo games like Queens, Super, Grand and Big Ben. Next, you can hop on an online slots tour through a range of classic and new hits like like Five Pirates, Arabian Knights, Big Ben, Britton Aire and Easter Bunny. The Queen will also let you can hang out with the other subjects in the royal chat rooms to play extra games and scoop extra treats. You can even hunt for royal treasure with heaps of other side games and mobile games on the go!